Upgrading your front door to something more thermally efficient is an easy way to make your home warmer and help cut down on your energy consumption. XtremeDoors are better at insulating than timber – six times better than timber, in fact – so you can relax in a warmer, more comfortable environment. Use less energy and still enjoy a warm home by replacing your front door with an XtremeDoor. A combination of a high insulating foam core and PVCu edgebanding makes XtremeDoor incredibly thermally efficient, keeping your home warmer when it’s colder. A draughty front door leaks heat and lets cold enter your home. Having the heating on only for it to escape through your door is wasting energy and costing you money. Not to mention paving the way for damp to creep into your home. 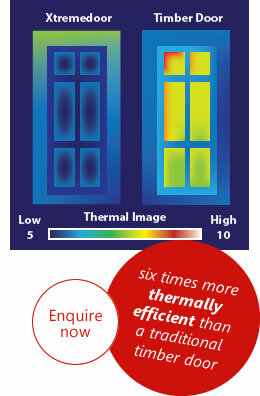 XtremeDoor stops draughts, keeping the heat in and saving you money on your energy bills.